What you see is what you get in art gallery co-owner Madel Ramon’s family house. The adobe-clad façade of the 1960s structure would already clue you in on its interiors. The furnishings aren’t your expected contemporary-modern pieces, but rather, an eclectic mix of vintage finds, midcentury modern classics, and art—lots of art. Upon entry, guests are greeted by a tableau of two iconic 1960s Saarinen Tulip chairs sandwiching an MM Yu painting. 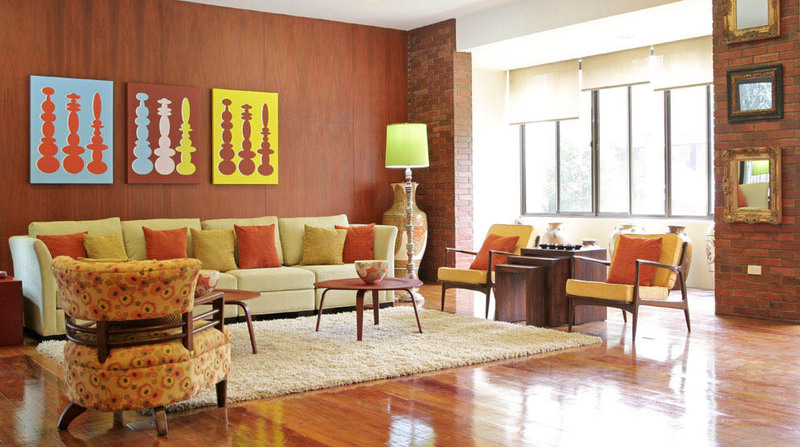 More retro furniture pieces are tastefully arranged in the living area. These pieces are made colorful by slipcovers and pillows in groovy, psychedelic hues, and made even more interesting by the mishmash of unexpected décor. “Mom insisted on using oldstuff and ornate pieces,” says Madel, who took charge of renovating the house when the family acquired it. She also had to take into consideration her father’s fondness for happy colors and patterns. Armed with a background in architecture and interior design, Madel set out to create a house that caters to both her “clients’” (meaning: her parents’) wishes. She accomplished it easily, with room after room of cheery prints and the nostalgic furniture to prove it.